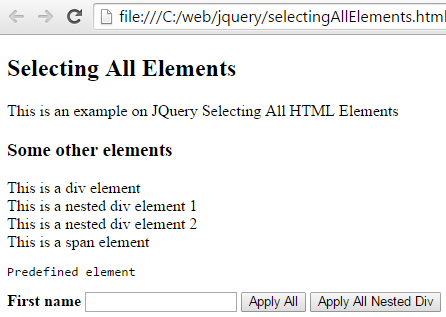 jQuery selector syntax provides a simpler way to find all html elements using $(‘*’). The returned object is a jQuery object representing all the HTML elements. 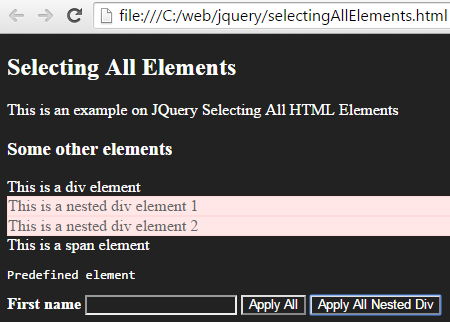 Any action on the returned jQuery object will apply to all the HTML elements on the page. In the below html code, we have used some common html elements like <h2>, <h3>, <div>, <span> etc. If you want to select all the nodes, you simply need to use the “*” selector. When you press the ‘Apply All’ button, the click event is triggered and its event handler is executed. The button’s click handler will change the background color of all selected elements to dark color and the text color to white. The second button ‘Apply All Nested Div’ will apply the change only on the nested div elements. 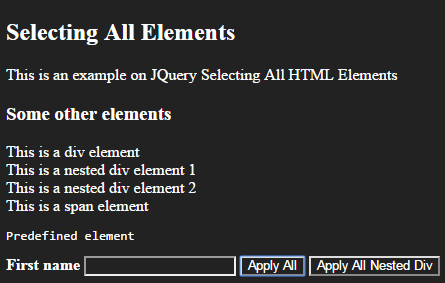 This was an example about jQuery selecting all HTML elements.